What to make with Cauliflower? Though, I think I am craving the roasted cauliflower from MFK Fischer’s memoirs – warm and roasted with heavy creme and shaved gruyere. Sounds super comforting right now. This is the first I’ve heard of a shaved cauliflower salad – it looks delicious!! Curry would be delish! I worked it into my last one. Just this week I made the Roasted Cauliflower with Gremolata Bread Crumbs from the new Food52 cookbook, and it was delicious. (Seems like roasting is the way to go with this cruciferous vegetable.) I really like the recipe because it seems like something the Italians would have for antipasto during winter. Can’t wait to make this with the purple cauliflower from the farmers market. awesome! you’ll have to let me know how you both like it. Mmmm shiitake mushrooms- hubs and I feel the same way!! Roasted cauliflower dipped in homemade pesto. Best snack ever. Or, let’s be real, meal. I love cauliflower fried ‘rice’ and packed with peppers and other veggies, plus lots of ginger and garlic, it’s so delicious and light. Now I’m craving that, too! I make roasted cauliflower leek soup with a little cashew cream and thyme! 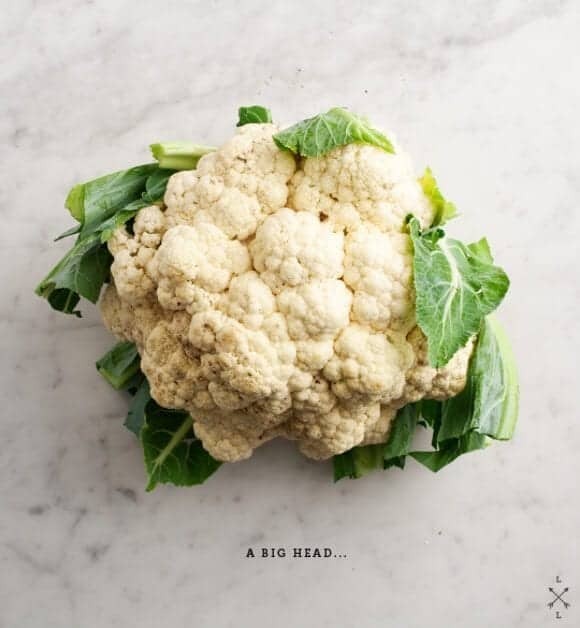 We have been getting those giganto heads of cauliflower, too — I guess that’s just how they grow in Texas! ha, well everything is bigger here, right? next time I’m going to blend my soups 2 ways – nondairy for me, and this gruyere version for Jack… I know he’ll just die over it. (One of his favorite things is gruyere grilled cheese). Cauliflower with breadcrumbs: cook cauliflower, heat a pan, add butter and breadcrumbs. Mix with cooked cauliflower, season with salt + pepper. Enjoy! Cook cauliflower, prepare bechamel sauce. Add cooked cauliflower to a pan, add bechamel sauce, add sliced ham and/or cheese if you like. Bake in oven. I like to blend it to make a soup creamy! Roasted cauliflower garlic onion soup (toss it all in the oven) with smoked paprika oil as finishing touch: it doesn’t get more comfy than that! Sounds good, do you puree it or keep it chunky? 2. Mashed! Combine it with parnsip or potato or pureed white beans or cashews for extra creaminess. 4. Curry- coconut based or dry with potatoes-somehow absorbs all the yummy flavours and spices. 5. Cauliflower cheese. I’m not sure if this is just a UK thing but when we were little my Mum would make a white sauce, pour it over lightly steamed cauliflower, sprinkle with cheese and bake until bubbly. I don’t eat dairy now but I’m sure a dairy-free version could be made! thanks Emma, these all sound like delicious ways to go! Aloo Gobi is one of my favorites… I’ve never cooked it myself before so thanks for the link! I love Farmhouse Delivery! I’m so happy that they deliver to Houston, too. I have made a delicious ham and cauliflower gratin from Kalyn’s Kitchen and a curry soup from The Picky Eater blog. I’m thinking about soup again as well as a curry because it’s the world’s largest cauliflower. I’m glad I’m not the only one with the worlds largest cauliflower! I will have to go through your whole list of suggestions myself.. because I love cauliflower! I had been thinking of a mack and cheese sort of thing, I like your idea with the white beans… really, all 3 of these look amazing! I second the vote on cauliflower rice! It is so good! Saute some onion and garlic first and then throw in shredded cauliflower. Roast chopped fresh cauliflower in oven at 400 F for 40-45 minutes or until slightly golden brown. Let cool slightly. Puree in a food processor with 2 cloves of garlic, 1-2 T. tahini, salt and pepper, and fresh herbs (parsley, basil, oregano). I recently tried a Paula Wolfert recipe from The Food of Morocco. Cauliflower with olives and preserved lemons. It had the perfect balance of briny and tang. Delicious! If you like curry (which you clearly do) and making things from scratch (also evident) then this recipe from My New Roots for a tandoori spice mix, mixed with yogurt and smeared over a whole cauliflower (or half if you have other plans) and roasted in a super hot oven is wonderful. When I have a lot of cauliflower I usually make Roasted Cauliflower soup or Cauliflower and Potato Curry. Can’t wait to see what you make of this! Well, I just recently made a cauliflower and leek soup with smoked pepper that was really amazing. 🙂 Or you could do roasted cauliflower tossed with pasta, wilted spinach, and super pungent olives and roasted red pepper! I got an enormous one this week, too! I love to make MOCK SHRIMP COCKTAIL with cauliflower. Even my non-veg friends gobble it up! The recipe calls for 2 heads, but these caulis are so big I think one will do. I know the whole “mashed cauliflower” thing was big awhile back, but I was late to the game with it. Instead of just steaming cauliflower and topping with butter + salt a few weeks back, I decided to stick it in the food processor with herbs, butter, garlic, and milk. My husband and I both loved it! I was kind of shocked. I don’t pretend they’re potatoes, because they’re definitely not, but it’s still really delicious. There are so many fun versions you could make…curry spice…smoked paprika…etc. It’s definitely not fancy, but really tasty! my husband and i are huge fans. i just sent you a sweet potato and fuji apple soup featuring roasted cauliflower and bacon recipe. it’s been a winter staple for us. hope you like it too!! I recently tried this recipe and loved it! And it’s so easy- roast cauliflower, get pomegranate aerils, and make a creamy harissa dressing. For a healthier twist I used yogurt instead of creme fraiche. It was a hit at the potluck I brought it to! Well tonight we had these cauliflower sandwiches for supper. You almost don’t realize it’s cauliflower in there. It’s just real tasty! Haven’t tried it but this one looks amazing!! Martha Rose Shulman at The New York Times ran some good cauliflower recipes on January 8: “Sicilian Cauliflower and Black Olive Gratin,” “Cauliflower and Tuna Salad,” and “Tunisian Style Baked Cauliflower Frittata.” Try these. There’s also a recipe for Sicilian Pasta With Cauliflower in that article. I made it a couple days ago and it’s delicious! Cauliflower in all of its simple glory and in any recipe, just simply rocks! Great post! Haven’t seen anyone suggest cauliflower steaks so I will! Slice the head into 1″ thick slabs and marinate for a couple of hours in whatever flavors you feel like, I like either ponzu sauce or barbeque, then grill until tender/crisp over charcoal. So delicious. One of the greatest ways to use cauliflower is Raw Sushi! Cauliflower can be amazing alternative of cooked rice and it actually tastes so much better! My whole family loves it and its one of the must have items on every dinner table what I have with my friends! so interesting, I’ve used jicama in place of sushi rice before, never though of using cauliflower! So many great ideas! I’ll thrown mine into the ring as well: if you want to try a wonderful Indian breakfast dish, I’d suggest poha, a savory dish that features flattened rice, veggies, and few spices too. Here is a basic recipe: http://handfulofjoy.com/poha/. I make it frequently and add cooked cauliflower (boiled until al dente) along with the potato (oh, and cumin seeds too). Soo good. I know I’m chiming in late but I love me some cauliflower pureed with a little goat cheese! I also have a recipe for cauliflower braised in a Greek-style tomato sauce with cinnamon. Just cook it in salted water and enjoy with a knob of butter. A great quick side for example fish or roasted meat. ps. your roasted ‘b-day’ version with the poached egg looks delicious! I know I am way late, but roasted with a drizzle of oil and chaat masala is out of this world.